This is a perfectly adequate laptop for those on a tight budget who just want a really basic device for day-to-day computing, and who also want the reassurance of decent performance and battery life. However, it does suffer from the fact that those needs can be met by plenty of other laptops for even less money. A quick browse online reveals plenty of similar machines for £300 or less. They might have an hour shorter battery life and slightly older, slower CPUs or less attractive designs, but not by much, and they’ll still do the job. Model: The HP Pavilion 15-au072sa is one of six models under the HP Pavilion 15-au000 Notebook PC series. Targeted at students and home users, the HP Pavilion 15-au072sa is a budget-friendly all-round laptop equipped with entry-level hardware specifications for everyday tasks. It features a 2.3 GHz Intel Core i3-6100U microprocessor with 3 MB cache and 2 cores, 8 GB of DDR4-2133 SDRAM, a 1 TB 5400 rpm SATA hard drive, and an integrated Intel HD Graphics 520 graphics. 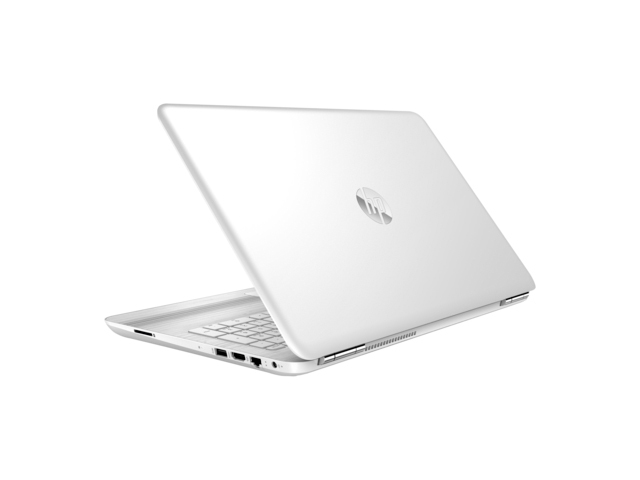 What HP calls a blizzard white casing gives it a modern and clean design. The display of the laptop is a 15.6" HD SVA BrightView WLED-backlit display with a resolution of 1366 x 768 pixels. The HP BrightView display is a glare-type, which delivers images with higher contrast and more vivid colors. While it can deliver more intense and saturated colors, black appears to be deeper on the glossy display compared to a matte display. However, the glossy display reflects environment lighting, be it a direct light source or sunlight through a window. Thus, it is best to use the screen under controlled indoor environment. As for input devices, the HP Pavilion 15-au072sa features a full-size island-style keyboard with integrated numeric keypad and an HP Imagepad pointing device with multi-touch gesture support. The HP Pavilion 15-au072sa measures at 38.3 x 24.3 x 2.25 cm and weighs at 2.04 kg. The weight of the laptop is quite standard compared to other 15-inch laptop models. It weighs the same as a 15-inch MacBook Pro with Retina display. A 2-cell 41 Wh Lithium-ion battery delivers up to 9 hours of battery life. Besides that, the HP also features fast charge, which is capable of charging the battery up to 50% in approximately 30 minutes. For wireless connectivity, it features an Intel 802.11ac (1x1) Wi-Fi and Bluetooth 4.2 combo. It is compatible with Miracast, which is a wireless display standard designed to mirror smartphone, tablet or computer screens to television without requiring HDMI cables. However, Miracast can only be used if both the computer and the television support Miracast. As for audio features, the HP Pavilion 15-au072sa features dual speakers with B&O PLAY and HP Audio Boost. B&O PLAY by Bang & Olufsen and HP Audio Boost are audio technologies often delivered by HP to enhance audio experience with smart amplification for a clear and dynamic audio experience. In addition, the laptop comes with an HP Wide Vision HD Camera with dual array digital microphone for convenience in video calling. The laptop comes pre-installed with Windows 10 Home 64 bit. Besides the operating system, HP also adds some bloatware and software such as the CyberLink PowerDirector, Netflix, HP CoolSense, HP Lounge, and HP 3D DriveGuard. As for input/output ports, it features an HDMI port, a headphone/microphone combo, a USB 2.0 port, two USB 3.0 ports, an RJ-45 port for Ethernet connection and a multi-format SD media card reader, which supports various types of memory cards.